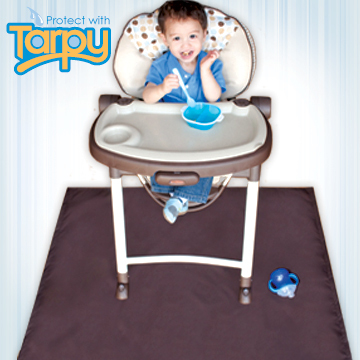 The Tarpy ® Activity and Clean Up Canvas provides and alternative to traditional highchair mats and splat mats on the market. The clean up mat for children is made of a durable nylon that is coated on the bottom side that prevents spills or other messes from leaking onto surfaces, such as the floor, table, and carpets. This patented splat mat is so versatile, you will find so many other ways to use it. Our Tarpy Activity and Cleanup Canvas is easily clean with by simply wiping with a damp cloth, shaking it off, or toss in the washing machine for the messier times that occur. The compact material is super compact and makes it very easy for you to roll or fold and take with you. With the adventures of being a parent, you never know when you may need your Tarpy®. So Keep it Clean, Keep it Easy, and always be prepared by taking your Tarpy® where ever you go. See more information about our patented highchair mat.